An L.A. cop is unwillingly teamed up with an Orc rookie and when they stumble across a magic wand during a routine call they become targets for every cop and criminal in the city. 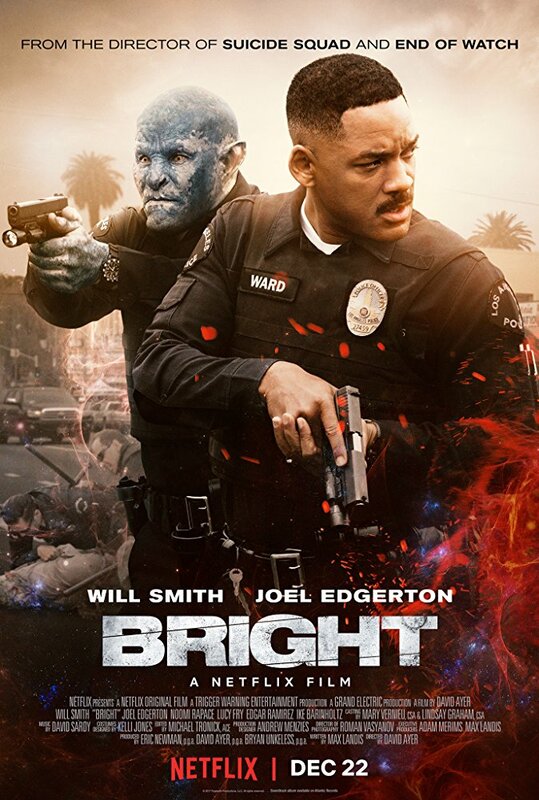 The obvious comparison for Bright is 1980's buddy cop sci-f thriller Alien Nation which was based upon a similar concept, except in this case the aliens are switched for characters from Tolkienesque fantasy mythology. In a nod towards class boundaries, the Orcs represent the underclass while the elves are the super-rich movers and shakers with humans somewhere in between, but while Alien Nation attempted some - albeit clumsy - social commentary, Bright is literally just a chase movie about a magic wand. It's that stupid. In fact, if the script had been a pastiche executed by the likes of Simon Pegg and Edgar Wright it could have worked, but ironically the reason it's so laughable is because it takes itself so seriously. The special effects are nice and the action well handled with the pursuing elves coming across like the agents from The Matrix, but it can never escape the idiotic written-on-the-back-of-a-fag-packet-while-drunk premise. More R.I.P.D. than District 9, Bright has the feel of a big budget version of a straight to DVD eighties B-Movie...but not in a good way.